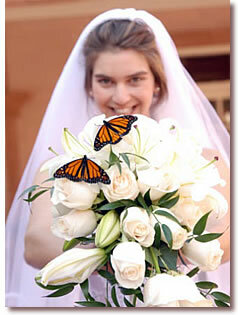 Make your wedding and other special life events be forever remembered by releasing live butterflies. We provide only the highest quality butterflies for release. Call us for more information or to place an order. Butterfly Releases…Live butterflies for the special times in your life will make it the most memorable event you and your guests have ever experienced. As the butterflies fly around and even land on guests, you will see the delight and excitement on their faces. They will leave talking about the release and some may even be walking out with a butterfly on their shoulder! What a perfect photo and video opportunity! A butterfly release can capture the memories of your special day only the way a butterfly can! 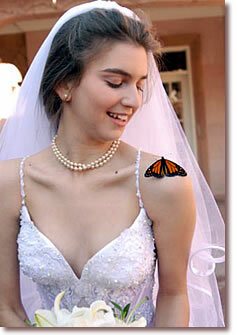 For weddings ... We have a wide range of butterfly release accessories and wedding favors for weddings or special events. A variety of beautiful displays are also available to show the butterflies. Come See us at the upcoming Bridal Extravaganza Show! Release butterflies individually or fill the sky with butterflies from a mass release box or display. The release may be incorporated into the ceremony. As the butterflies are released, read a poem, say a prayer, have everyone make a silent wish, make a dedication, or shower the bride and groom with butterflies. We have a variety of poems and prayers for your use. 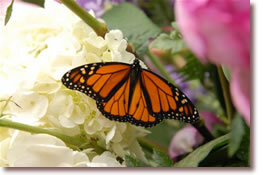 We are locally owned and operated, assuring quality, healthy butterflies and personal assistance. As an active member if IBBA, we adhere to the highest standards in our business. Butterflies are environmentally friendly and beautiful. Locally, your butterflies will be delivered by our company to you/your event location the day of your event along with any displays and accessories. Complete instructions accompany your order with tips for release, display, photo ops, etc. A personal butterfly attendant is available locally for an extra charge. We can also ship nationally via FedEx Overnight the day before your event. Contact us with any questions or to place an order.